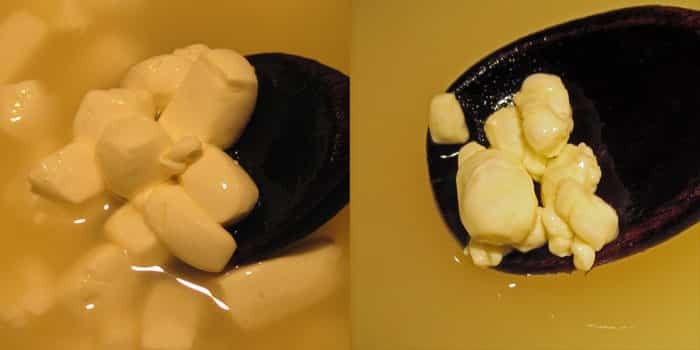 If you've tried the 30 minute mozzarella cheese and the fromage blanc cheese (or even if you haven't) and would like to tackle a slightly more challenging cheese recipe, then you may be ready to to learn how to make cottage cheese. Homemade cottage cheese can be ready for eating fresh or using in recipes in just a matter of hours (and you may just impress your friends and family with you tasty cheese craftiness). This recipe is adapted from the large curd cottage cheese in the book Home Cheesemaking by Ricki Carroll. I can't recommend this book enough. *Note: This cheese needs to sit for several hours to culture, so make sure you plan ahead so you have enough time. 1. Warm the milk to 72F. If using calcium chloride*, add it now. Add the starter and mix thoroughly. I will normally use skimmed milk for this cheese and save the cream for another recipe, adding a little cream back in at the end for a richer flavor. I make this cheese in a large, stainless steel pot with a very thick bottom. If you have a large double boiler or want to rig up a double boiler by nesting two pots, that might also be helpful. 2. Add 1 tablespoon of the diluted rennet and mix thoroughly with a gentle up and down motion. I use my potato masher to blend the rennet up and down through the milk. Cover and let set at 72F for 4-8 hours, or until the curd coagulates. The curd will be rather soft. 3. Cut the curd into 1/2 inch cubes. Allow to set, undisturbed, for 10 minutes. use a long knife that reaches all the way to the bottom of your pan, and move smoothly and gently – don't tear the curd. 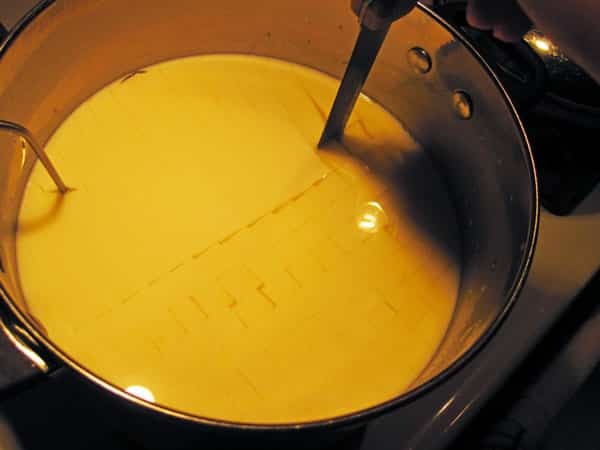 Try to keep your cubes as uniform as possible so your cheese cooks evenly. 4. Place the pot on low heat. Increase the heat by two degrees every 5 minutes, until the temperature reaches 80F. Stir gently to prevent the curds from matting. On my stove, I use my smallest burner set to 1 or 2, and set my kitchen timer for five minutes, and then watch, stir, and adjust the heat accordingly. If you have a large double boiler, you may prefer to use that instead for more even, gentle heat. 5. Increase the heat by three degrees every 5 minutes, until the temperature reaches 90F, stirring gently to prevent the curds from matting. 6. 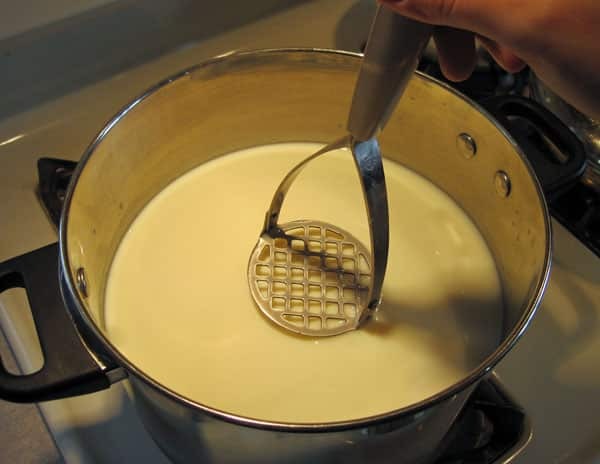 Increase the heat by one degree per minute, until the temperature reaches 110F, stirring gently to keep the curds from matting. Again, watch your heat and try not to heat too fast. Slow, gentle cooking makes for a more tender curd. 7. Maintain the temperature at 110F for 20 minutes, or until the curds are sufficiently cooked and no longer have a custardlike interior. Stir gently every few minutes. 8. 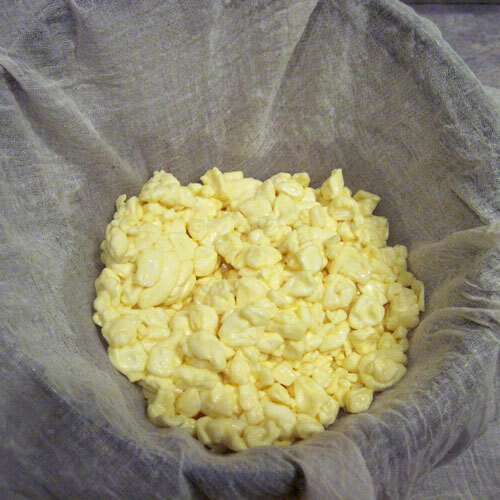 When the curds are sufficiently cooked, let them settle to the bottom of the pot for 5 minutes. 9. Pour off the whey. Pour the curds into a colander lined with cheesecloth. Tie the corners of the cheesecloth into a knot. 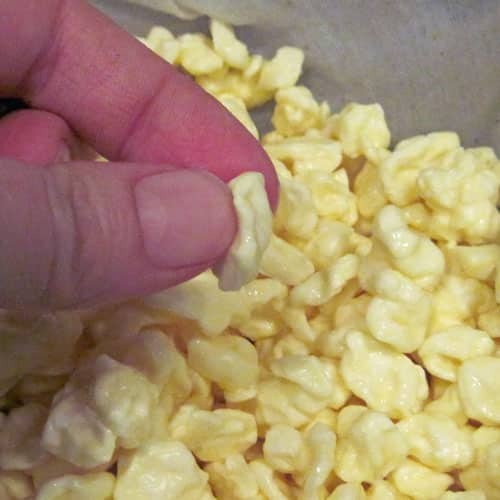 If a less sour cottage cheese is desired, wash the curds by dipping the bag several times into a bowl of cool water. 10. Let the bag drain for several minutes. 11. Rinse the bag in a bowl of ice water to cool and place the bag in a colander to drain for 5 minutes. 12. Untie the bag and place the curds in a bowl. Break up any pieces that have matted. If desired, add the heavy cream to produce a creamier texture. (I always add the cream, but the cream free cheese will be lower in lactose.) As you can see from the photos, this makes a LARGE curd cottage cheese, which we prefer. The Home Cheesemaking book also includes the recipe for small curd cottage cheese. 13. Add the salt and herbs to taste, if desired. 14. Store in a covered container in the refrigerator for up to one week. This cheese takes about 6-10 hours from start to finish, with 4-8 hour rest time. When the curds were super fresh (right out of the pot) they squeaked, but by the next day the squeak was gone. I usually make this when I have other flexible tasks to do in the kitchen so I can check on it as needed. It doesn't require constant attention. *Note – Calcium chloride is added to milk that has been commercially pasteurized because the heating process decreases the amount of calcium in the milk, which negatively affects the coagulation of the milk (so the rennet can't do its job as well). To pasteurize milk at home, heat the milk in a clean non-reactive pot to 145F and hold for 30 minutes, then chill in an ice bath to 40 F and refrigerate until ready to use. I have never bothered to pasteurize the milk for this recipe and it has worked just fine for me. I assume no liability for your choice of milk use. I figure we should all have the right to choose the food we eat. For those who are a little more daring, you may be able to use nettle rennet in this cheese with good results, but I have not tried it yet. I purchase some of my cheesemaking supplies locally from House of Homebrew. The rest I order through Cultures for Health. I hope you'll give this recipe a try. It's a good way to use up skimmed milk (I prefer full fat for most recipes and drinking). Let me know what you think, and if there are other recipes you'd really like to see. Laurie, you mentioned that the curds squeaked the first day. I’m wondering if you didn’t add the cream, are they sort of a drier/firmer curd? Like rather than cottage cheese you would buy in a container at the grocery store, are they more like little rounded chunks of cheese? I ask because in Quebec, they use fresh cheese curds to make poutine, which is too delicious not to do at home if you can and although you can buy cheese curds at our grocery stores from time to time, making them yourself would be so much better. In your pictures it looks like you could pick up those curds and they’d be kind of solid, which is why I ask. Rosalyn, I’ve never had poutine, but I think from people’s descriptions that when this cheese is fresh, it’s quite similar. 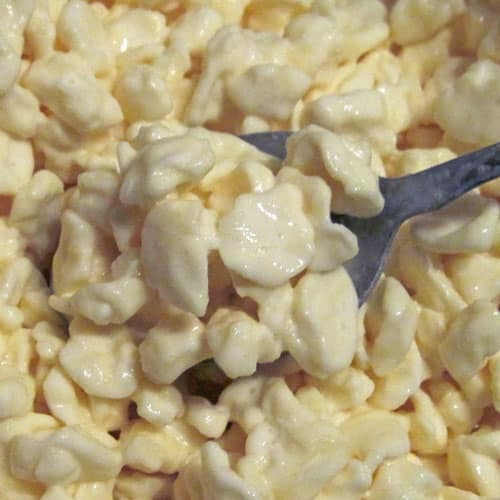 Once it sits (even a few hours), the curds become much softer, more like standard cottage cheese. This is great! I’ve been wanting to learn how to make my own cottage cheese! Thank you for sharing this! How much cottage cheese does this recipe yield? Phyllis – it yields about 1 1/2 pounds, which fills my four cup pyrex storage container a little over half full. Glad you mentioned you’ve never pasteurized at the end. It’s been years since I’ve made cottage cheese but the book I used ( which I don’t have anymore because a friend borrowed it, and loaned it out and lost it ) didn’t call for pasteurizing, just use raw milk. It worked well every time. As long as you’ve got clean milk from a source you trust, I think raw milk is the better option, but not everyone has it available. I’m a big fan of Ricki Carroll’s books and kits – still trying to make the 30 minute mozz, but even the milks not marked UHT or Ultra-Pasteurized are letting me down. Any ideas? I think almost all dairy is now UHT now, even when it’s not marked. You could double check with the milk producer to be sure. I’ve only made it with raw milk, and that’s almost a no-brainer. If you can find a smaller, local brand in glass bottles – by us we have Lamers Dairy – they tend to be the only ones who still use the lower temp pasteurization anymore. UHT is faster. There’s a bottled organic brand that is low temp pasteurized, too. I think Kaloma may be low temp, if you can find that in your area. i made ricotta from the whey.. but there is still whey left after you made the ricotta.. what to do with the leftover ..leftover whey?? What do I do? Wellll….I usually pitch it, because my fridge is busting at the seems and I’ve got no room to stash it. I tried to water plants with it, and some critter came and dug up my flower bed looking for the cheese. You can use it in soups and stews, in smoothies, feed it to critters, or drink it straight or with flavoring. Whey is also good if you make fermented vegetables. Most recipes call for about a tablespoon to kick start the fermentation process. When I making cultured veggies, I typically use whey from yogurt or kefir because the cultures are more active, but this might do in a pinch since it’s only heated to 110F. I used to have a recipe for whey bread, but can’t find it now. I’m sure it could be googled. All the pets I’ve ever had love it, when it results from renneted cheese, not so much from the lemon juice/vinegar cheese though. You can sub whey for water in pretty much any bread recipe. The cats aren’t too fond of whey.